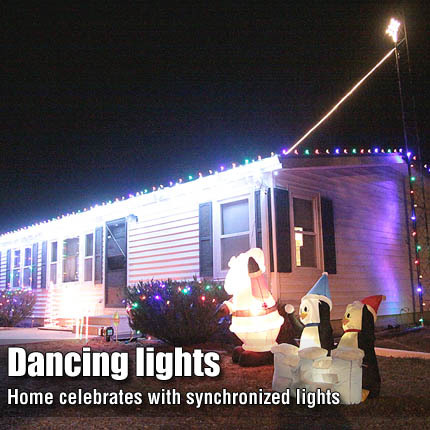 The home of David and Roxanne Hanner, 1208 N. 15th Street, features LED Christmas lights synchronized to holiday music. OSAGE CITY—Recession motivated cutbacks may have encouraged some to cut back on holiday lighting, and noticeably fewer homes are decorated this year. That isn’t the case at 1208 N. 15th Street, in Osage City. David and Roxanne Hanner, Osage City, stepped up their Christmas lighting with a musically synchronized display, a project David has been working on for about a year. The box, which can be purchased for around $100, came preprogrammed with multiple Christmas songs and eight outlets, which blink to the music. “We played around with it until we got what we liked,” David said. The Hanners set up their display the weekend of Nov. 12-13, and have been running it every evening. “When we go to bed, we shut it off,” David said. The shut off saves power, as does the conversion to LEDs, which use around 10 percent of the power of traditional ligts. David and Roxanne set up the display for their grandchildren, many of whom live locally in Osage City and Topeka. The response from neighbors has also been good. She anticipated it would be a project that would grow each year. “I’m sure he’s not done,” Roxanne said.